"Ugh, maybe I should take refuge in a nearby store..."
The day was still as busy as any other and since many people were pushing eachother and such, of course it would make it some what easy to lose someone. Kelsey and Kyo had come to stop infront of a store which sold leather garments of all kinds and honestly Kyo looked worried while Kelsey looked rather well emotionless for only a short time before listening to his younger brother. "Where could of Jun have gone too?" Kelsey looked away and he seemed not to care much but spoke. "We need to use our senses in this situation. Do you hear any rowdy foot steps?" 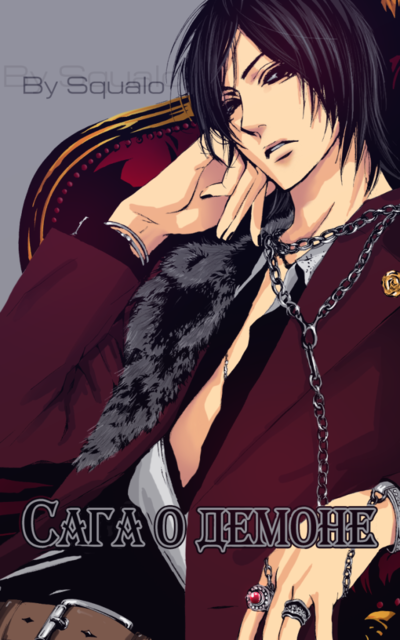 Kyo closed his eyes only then to shake his head and looked to his older brother. "No, why of all times did he have to run away!" Kyo scoffed and messed with his red colored hair and closed his light blue hues showing his irritation. Kelsey blinked noticing something and walked off making Kyo double take and try to chase after his older brother who disappeared into the crowd. 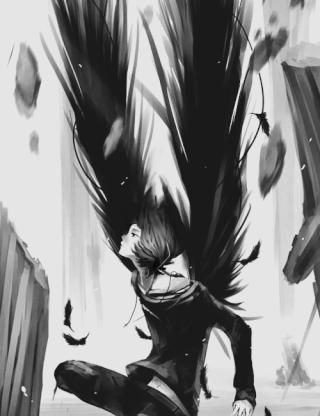 Kyo clenched both of his fists and threw his arms up in the air. "WHY DID YOU DO THAT!" Kyo couldn't help but shout it, since he was already annoyed as well as being left behind again he needed to expression his anger. Jun laughed looking to each different person and bumped into another teenager though he looked different and the blonde haired teen couldn't help but stare in question to the other. "Sorry." was all that Jun had said but then flinched hearing his brother, Kyo shout. It made the teenager smile in a devilish grin and he couldn't help but laugh while hugging his belly. "Hah! Kelsey you son of a gun!" that was a compliment in a weird way which Jun was giving to Kelsey for he just loved it when Kyo had his anger fits. Through the crowd of plenty did Kelsey pick up on laughter and appeared through the crowd and behind Jun. "Jun..." was all that Kelsey said making the teenager jump almost ten feet in the air before laughing and hugging Kelsey who didn't return it though he gave a small sarcastic smirk in response. Meanwhile, Kyo was pushing his way through the crowd and couldn't help but whisper deadly threats and finally catching up did he plop down to the floor and sigh out in pain making Jun smile. Kelsey on the other hand quickly bended down to his little brother, Kyo. Kyo had a nervous look on his features as he watched Kelsey feel him around the chest checking for any broken bones. Jun laughed louder as he watched this go on, the people on the other hand went around the small party seeming to look rather weirded out by the small group. Mori blinked as his black cat ears twitched to someone yelling and he frowned slightly since the noise didn't help at all with his sensitive hearing being hurt already form all teh strange sounds around him. The neko blinked as he wondered about what the person yelled at then again, did he lose someone? It sounded like that kind of frustrated sound that someone would make if they lost someone. A yell Mori knew too well considering the girls liked to abandon him as they went off to explore on their own which annoyed the neko to his wits end. He felt someone bump into him and he blinked before looking to a blonde not too far from his own age though he looked younger than Mori. The boy opened his mouth to say something, this kid was probably the one who got lost considering how he was acting while some parent like figure dispaired over the loss of the kid but he shut his mouth seeing how it wasn't really his problem to deal with anyway. The neko blinked as other guys started to pop up, probably the escourts or guardians of the blonde teenager. Like the other people in the crowd, he couldn't help but stare at the weird scene in front of him. Mori crossed his arms quietly as he watched, though unlike the people around him, he wasn't doing so in private as he openly expressed his curiousity at these new comers, not having seen them around Miyagi before. Silence fell over the two brothers and that only Jun was laughing especially at the fact that the other teenager had a very interesting expression. "I don't know them." was all that Jun said though he smirked lightly like a brat afterwards. Kelsey stood up and he looked to Kyo and spoke distantly. "You are fine just tired. Why are you tired?" Kyo's expression changed drastically from a nervous one to a irritated one. "Why! You left me!" Kelsey blinked once and he turned away from Kyo making his head lower and he said softly to himself than to the other's around him. "I just had to get stuck with two characters who liked to explore didn't I? I feel more like their mother than their brother." Jun looked to Kyo and smiled before skipping over and bending down to a faintly depressed Kyo. "If it makes you feel better I know you as my maid?" Kyo narrowed his eyes at a largely grinning Jun and said sarcastically. "Oh, yeah that makes me feel better..." Jun pouted and he spoke sort of hurt. "It should! After all I am not walking away from you like big brother had done. Do you want to hug your other counter part?" Jun showed Kyo the orange not so amused looking cat making Kyo's expression changed to that of a blank one making Jun snicker. Kelsey looked to the other teenager and he blinked a few times, to Kelsey he didn't know if he had been there long or was he a part of their group. Kyo stood up and Jun placed the orange cat back into the bag. Kyo then noticed Kelsey staring and he sighed. "Do you want to say hello?" Kelsey looked to Kyo and seconds later he looked back to the other. "Hello." Kyo nervously laughed while Jun laughed lightly before smiling in a apologetic manner. "Again, sorry for bumping into you. I saw someone who had got the last toy I wanted and so I went to try to steal it from them but it didn't work out." Kyo glared to his little brother Jun who was grinning almost innocently. Kelsey on the other hand looked to his two brother's without emotion. Mori moved one of his hands to his face where it hid his smirk at the teenagers answer to his brother. Brothers, they didn't really look alike but then again, he and his brother Asahi didn't look alike either. He wondered about this thinking about his parents again since they had ditched them when they were young. Many people who he had told this felt sorry for him but he never understood why. He told them that he could really care less who his parents were or where they are today. Even if they had died, he wouldn't feel a speck of pity considering they didn't raise him, Unknown did and it was Unknown who had adopted them. The neko blinked as he noticed his attention had traveled to the ground in his thoughts and he looked up, meeting one of the boy's gaze and he raised a questioning eyebrow before smirking just a bit again. He looked to the young blonde one and put on one of those patient smiles that one would originally give to young children. "Oh? But couldn't you just ask for the lady to put more in stock? I'm pretty sure it wouldn't take too long for her to retrieve some more out of the catalogs. And even if you were impatient, you could easily go to another store or go online and order?" Stepping from others walking around them didn't seem to bother the three brother's all that much. Jun made a dull expression and he replied with his eyes narrowed. "I did and she told me to come back later." Kyo seemed to look to Jun easing his glare he had on earlier and he shrugged before saying with his own arms crossed. "You know you could always find a different hobby? Maybe enroll in a mafia like older brother at least you could get some manners." Jun stuck his tongue out at Kyo who laughed in a harmless way. Kelsey listened to his brother's and his expression became serious. "Never would I let you or anyone else do such a thing as to place yourself into such a dangerous job." Jun flinched and Kyo covered his mouth making a sad expression, it was always a touchy subject. Though, Kelsey had lost his memory he still remembered some parts of his experiences in the mafia and never would he think of placing someone else into such a dangerous kind of job. Jun looked to Kelsey and he walked over to his older brother and took his hand which was his innocent way of saying he was 'sorry'. The only reason why Kelsey enrolled into such a dangerous type of job was only cause their were no other jobs back then. To survive, Kelsey placed himself into close relationships with others and making them his siblings though they were not really siblings was the only way to survive. Kyo decided to change the subject and he looked to the other teenager who was about the same age as Jun and he placed his hand out. "I'm Kyo. That their is Jun. The other who is very cool looking is Kelsey. We aren't really brother's but we have gotten use to calling eachother siblings. Their are seven others just to let you know." Kyo politely smiled but blinked when Jun hopped over and looked to the sword on the other's back and he pointed to it being a little bit of a pest. "Why do you need a sword?" Kyo seemed to look concerned while Kelsey watched them silently. Mori raised an eyebrow to the small blonde one and he glanced to the side, wondering if the girls would ever come to act as bratty ast this one day. He certaintly hoped not because this was going to be a pain. The neko would have to disipline those girls to make sure they wouldn't stray to this kind of teenager or child for that matter. The black haired boy turned his head back to them as one raised the topic of the mafia and they all silented after one comment from the usual silent one. Mori stared at him, wondering what his story was, must have been interesting if he was involved with the mafia. 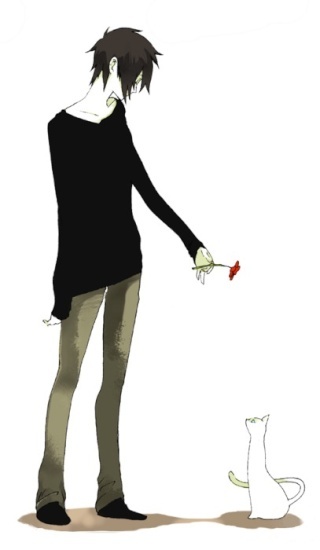 The neko twitched his ears and he looked to the one called Kyo and gave a small polite smile as he introduced them all. The small blonde one was Jun aparently and the 'big cool looking one' was Kelsey. Mori stared at Kyo for a moment, wondering if he heard him right. Kelsey, wasn't that a girls name. Oh well, it wasn't like it couldn't have been a unisex name either. He offered a small smile to Kelsey in greeting. "Nice to meet you all. I'm Mori. And seven of you? I can barely handle a single sibling, heh." He blinked as he felt the blonde point to the sword. Mori glanced to it and he gave Jun an 'innocent' smile. "I don't believe that's any of your business, Little One~"
A whining hum came from Jun as he pouted and he blinked before smiling brightly as he said. "Are you like the guy named Sephiroth who needs a seven foot long sword to make him look bigger?" Kyo rubbed his chin wondering as well as why was he wearing a sword but decided to not ask for it may come to be a touchy subject much like the subject of the mafia to his older brother who had served in it for over 300 years. Kyo looked to Jun and said softly. "Don't pester our new friend." Jun pouted and walked away but hide behind Kelsey as he looked up to his older brother. "Kyo is being mean to me." Kelsey looked to Jun silently but he noticed the small smile he had gotten in greeting and he sarcastically smiled back which was his only way of showing emotion for he could not show much then he returned his attention to the pouting Jun. "Being mean is a normal response from a sibling, if you do something to make others dislike you in anyway then life will be hard for you to live." Jun pouted sadly and he looked down going silent for sometime before childishly whimpering. "You are so depressing." Kelsey looked to Jun silently without emotion and Kyo nervously laughed before shaking his hands to their new friend. "Do not mind Jun, he is always like this. Our other brother's are a lot more better than Jun since they are older than us. No one is older than Kelsey though." Kyo poked his own chin before thinking and asking curiously. "So, what brings you here Mori? Shopping, do you need us to help you?" Mori's eyebrow twitched as he looked the little blonde. Like he was one to talk. He was rather sensitive about his height since he knew he wasn't exactly tall for a boy and neither was his body really...masculine or muscle toned like others who did regular football and were outrageiously tall in that game of basketball. The neko's ears twitched on top of his head and he gave a small tired sigh not really in the mood to deal with yet another child when he had plenty to cope with at home. Mori blinked at Kelsey's sarcastic smirk and he couldn't help but let out a small chuckle in amusement then turned to Kyo again as he started speaking once again. The boy's expression went thoughtful as he looked to the side as the shops around them. He still didn't know what else he was going to do for Nana's birthday and couldn't come up with anymore ideas. "I'm looking for a present for a small girl but I already got her a few plushies from her favorite animes and a cake. I wanted to do something else but nothing comes to mind..."
Silence came from the two brother's who were Kelsey and Jun on the other hand Kyo was thinking and smiled interested soon afterwards. "Something for a little girl? Hm, maybe Kelsey could give her a diamond stud choker or maybe for a idea you could always trying to have a picnic or something like that. Since we are new friends maybe we could entertain her." Kyo's response was a bit teasing for he indicating that Jun was up for sell for doing parties. Jun didn't say anything before poking Kelsey who had his eyes on both Mori and Kyo then it changed to look to Jun. "I am thirsty. Could you go buy me something to drink?" Kelsey looked around from side to side before walking off in search of a drink stand and Jun softly called after him. "Make sure it is a cola!" Kyo sweatdropped upon hearing his little brother telling his eldest brother to do something and he sighed shaking his head. "Kelsey can never say no to anyone, I wonder if that is going to hinder him one day?" Jun heard the response and he couldn't help but give a sneaky smile. "Why change him. That tells you something when the youngest brother's can control the eldest one." Kyo narrowed his eyes and he waved his hand to Jun which was his way of saying 'Yeah, but still you don't always have to send him on errands and spend his money on you.' Jun laughed and he placed his arms behind his head. "Hey, I'm taking the advantange for as long as I have it!" Kyo looked to Mori and gave a small smile. "What does this girl like? How old is she?" Kyo was always the observant one for when getting clues they can find the answers quicker. At the mention of a diamond studded choker, Mori looked absolutely horrified. His face going down several shades paler and he shook his head with a light sweatdrop hanging over his head. He wasn't one to do anything too drastic and Nana's father would kill him if he ever thought about getting Nana jewelry when she was so young though she was old enough to have her ears pierced, her father wanted to keep her as young as he could seeing as how he wasn't able to take care of her until later and the only reason Mori knew her was because he was her bodyguard as she was being hunted down for her strange ability. The neko lightly shook his head to the ideas but offered a small smile as if thanking him for helping out anyway or well trying too. Mori glanced to the other two and watched as Kelsey got sent off to do some errand for Jun. His ear twitched as he listened to the two conversing about it and he looked to Jun, perking his ears some as they went erect on top of his head. "Being the youngest is no excuse for being a slave driver. When he's old and your a little more mature, then you'll be the one attending to his everyday needs. Just remember that." Of course, Mori had heard something about Kelsey already being really old but he was just trying to make a point. He wondered how old though, his adoptive father was old as time itself being at four billion years old and knowing too much for his own good at times. Mori gave Kyo a grin as he let loose another amused chuckle. "She's really only about six so the choker may be pushing it a little? She's a bit of an otaku but she's real sweet and energetic." Seeing Mori's face change color made Kyo shake his hands in a way of saying that was a suggestion, Jun heard what Mori said and he pouted faintly. Moments passed by and Kelsey returned with a cold cola and handed it to Jun which made his expression change and he smiled happily as he opened his soda and sipped it obviously ignoring what Mori had said. Kelsey didn't stop their though for he handed Mori and Kyo one which surprised Kyo but he smiled none the less and took it. Looking over the contents of his soda did Kyo figure out that he had gotten the three of them the same brand of soda but then he noticed that Kelsey didn't get himself one which worried Kyo while Jun continued to drink his drink with innocent sips every now and again. "Kelsey, why didn't you get yourself one?" Kelsey looked to Kyo and he spoke. "I don't like soda." Kyo still felt bad but he knew that it would be best for him to accept the drink which he had gotten from his older brother. Kyo lightly laughed after opening his can drink. "Is that so? I guess the diamond stud jewelry would be to much. Kelsey likes diamonds and silver. So that would be a normal gift to get from my older brother." Kelsey looked upward and it didn't seem like he was irritated in anyway by his earlier errand from his little brother, that was a normal thing about Kelsey. Trained to being a emotionless and selfless figure it made things easier for Kelsey to take some orders back then. Other's often referred to Kelsey as a doll of some kind for never does he seem to show if anything bother's him much and yet he shows kindness and smiles and waves which were all sarcastic which is the only way to show that he some what does care. Kyo messed around with the top part of his soda before saying. "Then maybe clothes would fit? Hair clips maybe?" Jun remained silent along with a smile sipping his drink and Kelsey kept his gaze upward remaining just as silent as Jun though without much emotion shown on his face. Though in a way he looked curious as he did look upward. What else to get that little nutjob? The little girl was a bomb that way when she would be all excited and never seem to be let down by anything. Mori glanced to Jun as he watched his reaction quietly enjoying the effect before the blonde let it go when Kelsey returned with drinks for all of them. The neko blinked and he took his soda, looking it over curiously. "...Thank you. If you didn't want a soda then why not get some water or a iced tea?" The neko sipped at the drink and looked back to Kyo with his ears twitching of top of his head wondering if that would be a good idea. He slowly nodded his head and looked around the stores wondering where he would find such a thing. His tail slowly swung lightly in his thoughts which it usually did though not many people would notice the extra limb. "I suppose that would work..."
Kelsey's expression changed as he looked to Mori and he simply shook his head as he spoke distantly as if his thoughts were miles away from the planet. "Tea and water are somethings that I will not drink, all that I will drink is vanilla coffee." Kyo narrowed his eyes as he thought about what kind of color would a energetic girl would like. "Would she like any color? Is she picky like Jun?" Jun poked his head up at the mention of his name and he laughed a little as he poked himself in a way of saying that he felt complimented by what his brother had said. Kelsey seemed to watch the both of them converse for a while before looking to a store far away and disappeared. Long after Kelsey had left did Jun finish his drink and try to chase after him. It was then that Kyo narrowed his eyes with a blue cloud over his head. "They left again didnt' they?" Jun caught up with Kelsey very quickly but stopped when he saw that he entered into a women's clothing store and the teen stood outside and then later laughed. Kyo on the other hand tried to look to where his brother's had gone to and hearing laughter did he point in the direction to Mori. "Do you mind tagging along with us. I feel sort of better that I have someone who has more sense then the both of them to just wonder off without warning?" Kyo lowered his hand he was using to point with and he waited for Mori's response. Well, that was certaintely unhealthy. Almost as unhealthy as Mori's diet of eating every other day since he keeps forgetting to eat food. He sweatdropped a tad and continued to drink his soda solemnly as he stared at the ground with an impassive look on his features. Hearing what Kyo said made him think and he wondered about that but decided to play it safe and keep it with those child like clothes. "She's young but she's not really picky. I suppose I should stay with light colored clothing though and clothing that she'll like that isn't too child-like." He looks up and notices that two of the brothers are missing and he wears a blank face before turning automatically to Kyo as he asked if he would accompany him. The neko nodded and lead the way through the crowd, following the scent of the young blonde Jun and he glanced back to Kyo and waved a hand. Smiling and following after Mori he was glad that someone actually was mature unlike Jun who claims to be mature all the time and as he pushes himself through the crowd he picked up on laughter slightly becoming louder. Kyo's expression became a worried one seeing Jun laughing and pointing to the women's clothing store that Kelsey walked into. "Can you believe the guy! Has he no shame!" Jun snickered louder as he looked through the window seeing women of all shapes and sizes talking to eachother as they saw Kelsey looking through the little girl clothes and if anything that made Kyo almost faint as he he slumped to the ground covering his face showing his embarrassement. Jun looked to Kyo and he made a amused face to Mori. "Come on, you have to agree with me that this is funny!" Kelsey was unaware of the talking going on around him by women and he looked to one of the employee's and asked what would be a good color for a six year old girl. The employee with blonde hair and green eyes smiled and giggled and asked is he getting clothes for his daughter. Kelsey made a blank face and sort of rubbed the back of his head. All the women's chatter changed quite quickly and they blushed and giggled talking about the fact that he may be a single parent and a young one at that though it was quite the opposite. Kyo and Jun's face became blank as the women surrounded Kelsey and started giving him suggestions and asking what the six year old girl's name was. To put it simply the women thought that Kelsey was still single and wanted to know his make believe six year old daughter though it was wrong and that he was picking out clothes for Mori's friend who was six years old. It was a misunderstanding not that the women and women employees knew it. Mori blinked as he looked inside the store and spotted Kelsey in the little girl's section. He stared in surprise but it wasn't from seeing a man in the women's store picking out clothes for Nana or at least trying to help. The neko smiled a bit and he blinked towards Jun as he frowned then and he even glaced to Kyo on the ground and couldn't help but be ashamed of both of them. There was nothing wrong with going into a women's store unless you were to buy clothes for yourself there then thats rather questionable. Mori ignored both of their useless chatter and picked up Kyo by his arm with surprising strength for a boy with a feminine build as he and he also took Jun's hand, dragging both of them into the store with him without an ounce of shame crossing his face. Since he had raised not one but two girls as a bodyguard for a short time, he had been forced to do such things and was used to the stares by now which they were surely getting now that there were more than one male in the women's shopping store. "Well, no use staying out here. Let's go in and check it out." Gasps were heard from both of the brother's and well Kyo tired to cover Jun's face, Asaka who was 37 had told them to treat a women fairly as well as the clothes that they wear. Kelsey noticed Mori walk in with his young brother's and without a second delay did he walk over and show a complete outfit for a six year old girl. The garments that he had been suggested were alright since the shirt was a color of light purple and the jeans that were picked were of the average costing kind but had designs of stars on both pant legs. Kelsey remained silent and the small party of women all giggled and pointed still not getting over that such a fine looking man had a six year girl that was a cute daughter though they misunderstood. Jun saw the clothes and his eyes narrowed in a blank manner and Kyo nervously laughed before looking to Mori in a manner which showed he was curious. "Would she like that or not?" Jun couldn't help but shiver at the giggles and such he had heard from the women and he made a expression saying 'Are all women like this? Are they all seriously desperate for a man like Kelsey.' Kyo faintly laughed to the look on his younger brother's face and then looked to Mori in a curious manner although he couldn't help but think back to when Mori had brought the both of them in here and by dragging them not doubt. Mori abandonded the two brothers and stepped up to Kelsey as he looked over the outfit taht he picked out for Nana and he took it, checking to see if it was her size and he looked to the shelves trying to find a jacket for her as well. He settled with a white jacket that closely matched the design stars on the pants and he smiled at the whole thing together before perking his ears, two twitching as he looked around Kelsey at the big crowd of women. Wow, there were alot...Mori wouldn't have expected so many to group together just to pounce on one man. His tail swished slightly as he straightened up and looked to Kelsey with a teasing smile. "Wow, quite the catch, aren't ya?" Mori looked back to Kyo and he smoothed the clothes in his arms with his hand, wearing a smile. "Yeah, I think these will work out fine." Mori glanced to Jun and his expression and ignored it for now as he looked voer the clothes and the prices, calculating how much it was and how much he brought with him to spend on the girl in the first place. Giggles and such were continued to be heard and Jun waved his hand to the women. "Enough already! Kelsey isn't looking for desperate women right now." Kyo jumped to what his younger brother had said and covered his mouth before saying over his brother's mumbles. "Do not mind him, he is just jealous is all!" Jun glared to what his brother had said and glared at his hands over his mouth. Kelsey blinked blanky to Mori and he said distantly. "What do you mean by catch? Are you catching something Mori?" The women giggled to how cute the both Jun and Kyo looked which irritated the blonde haired teenager while Kyo on the other hand chuckled some what in a nervous manner. Kyo let go of his younger brother and he smiled glad that Kelsey chose the right kind of clothes, though the both brother's blinked with wide eyes as Kelsey handed Mori a very interesting looking card of silver and black. "Use this to buy the clothes and then go buy you some cold medicine." Kyo did a traditional fall and pushed Kelsey's arms down making the taller male blink and look to Kyo silently in a questioning manner. Jun laughed faintly to the fact that Kyo had done that and he was now ignoring the women's gossip around him and wondering if Kelsey ever wanted to do something sometime with them. Though when he showed his card made the other women seem interested and that included the women employee's. Mori blinked as he looked to Jun seeing as how he jumped out at the women and yelled how Kelsey wasn't interested in them and that made a rather surprised look come over Mori's face though he tried to hide it by looking down to the clothes and distracting himself with the cost in an act of 'Leave me out of this. Do whatever you want but i'm not getting in the middle.' Though it was quite rude to tell someone that. Jun was rather one who needed to be reined in a little more by his brother since this was now really getting out of hand with how truly spoiled he was. The neko glanced to Kelsey and sweatdropped, his eyes narrowing in confusion as he wondered if the man was really being honest was him or just playing around for the heck of it but when he held out a silver card and mentioned the cold medicince, Mori smiled nervously and chuckled. "Ah, that wasn't what I meant." Mori turned his attention to Kyo as he suddenly stopped Kelsey and he stared curiously before noticing that the women had stopped gossiping and were now listening into their conversation yet again. The dark haired boy didn't quite know what to say as he looked from the group of women to Kelsey to Kyo and then back to Kelsey to smile politely. "I can pay for them. It's alright." The silence was killing Jun and he walked out of the store with his arms up. "I'm out!" was all that he had said. Kyo double taked and he chased after his brother but not before turning around and shaking his finger to Kelsey. "Do not spend to much money! I know you have a lot but come on and be a better person to take care of your money! Wait up, Jun!" Kyo had left Kelsey and Mori behind and again awkward silence fell over the area and looking to Mori he took his card and placed it back into his silver black leather wallet full of other cards of silver. "If you say so. Is there something else you want to buy for this girl?" Finally the women understood and laughed to eachother while some seemed disappointed by the fact that Kelsey was not a single parent with one. Jun was standing outside again and noticed Kyo walk up making the teenager laugh and smiled pointing back to where Kyo had left them. "Was that smart?" Kyo laughed nervously and he walked over to a nearby bench earning Jun's attention and then he followed his brother. Kelsey looked to the direction of the mans clothes and kept his gaze on the different clothes and jewelry for men to wear. It wasn't long before a employee asked Kelsey if he needed anything else which made him blink once before walking toward the jewelry and asked. "Are this real silver?" The women employee giggled and told him that some of it was. As Kelsey talked to the employee did some other women talk about what had just happened. Mori watched Jun leave and he sighed slightly in relief before covering his mouth with his hand realizing that that was probably extremly rude and he watched as Kyo left soon after right on Jun's tail. He wondered how those two could have so much energy, he neraly wore Mori out just witnessing those two running around after eachother. The dark haired boy looked over the clothes one last time before shaking his head quietly to what Kelsey asked and he looked to the counter where the women were gossiping over a magazine, Mori really didn't want to talk to them seeing as how they were gawking over Kelsey earlier but he know he would have to. The neko sucked up his courage and walked to the counter, placing the clothes down and watching a woman tear herself away from the group and shoot him a quick, fake, maked-up smile before taking the clothes and checking them out. He waited patiently as he pulled out his cash which he left carelessly in his pockets, taking a few twenties out and handing them to the lady behind the counter than slipping the unused money back into his pockets. Grabbing the bag and the change, which he just slipped into his pocket, he walked over the join Kelsey, looking over the clothes even though they were probably, most likely, too big for him. The area around them turned to a most comfortable one and everything seemed to be normal now, Kelsey looked to Mori silently and he could not help but look lost in his emotions at the moment. Things sometimes were odd when girl's and women of all kinds made such a scene over such stupid reasons. Kelsey was a man that seemed to not care about other peoples point of views and if anything that seemed quite alright to the man. Kelsey continued to look to Mori and he couldn't help but ask. "Do you like silver? ", that was a simple question and if anything else he was curious about other peoples opinons and that was quite normal for anyone to be curious was it not. Jun and Kyo still sat outside and they looked very comfortable for they were out of the area where all the women had swarmed over their older sibling which wasn't a real sibling. Asaka would of course ask a question why they were outside and shopping at the time. The man had the eyes of a hawk and that was the truth. Kelsey looked to the clothes again and he could not help but seem to be interested in some kind of shirts with cool designs. The jewelry was something that caught his attention more than anything else right now and that was surely the truth. As the taller man looked to Mori in question he hoped that the answer would be positive or else he would answer negatively and if that were the case he could not help but accept it after all everyone was different. Mori looked over the silver pieaces that Kelsey seemed to be inspecting. Silver necklaces. Silver bracelets. Silver earings. Gold earings. Gold jewels. Gold rings. Rubies. Diamonds. All the shiny stuff was getting to Mori and he had to tear his attention away as he looked up to Kelsey, needing to tilt his head up some before he looked back down to the silver. It wasn't all bad, he liked it better than gold anyway. Gold was flashy, expensive, and not really something that Mori would ever really come to buy since he thought that it was useless unless in the paying kind of sense since well, everybody really liked money right? He didn't care for bronze...obviously for that reason of it being bronze. Silver though was something like an elegant piece of jewelery. It could be simple and it could be fancy at the same time which is what made it rather likeable. Mori nodded. "Yeah, more than gold, surpisingly." He stared at the silver pieces before looking away again toward something else in the store.